4.28 out of 5 based on 764 reviews. Tired of endlessly sorting laundry? 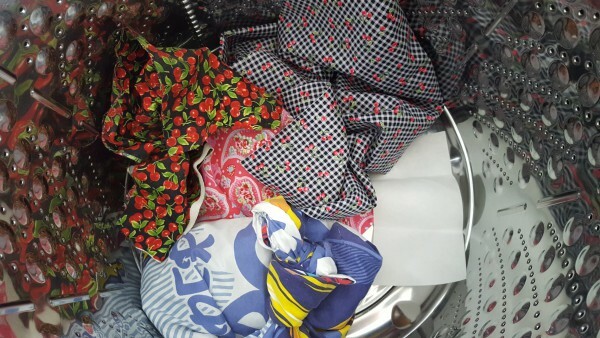 Have you ever looked at a stripy top or a spotty dress and felt confused about which wash to load it with? Will the spots and stripes leak colour onto your whites or will darker items in the wash spoil the white elements? There is a solution … which is why we are excited to announce the Colour Catcher® product review! 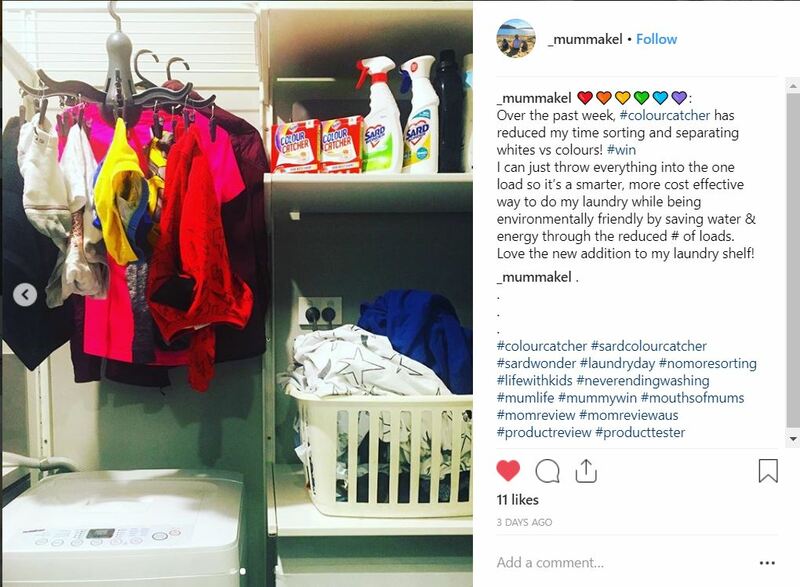 Mums everywhere are discovering the smart way to wash and save time, money and energy while protecting clothes from unsightly colour runs. Trap Colours – COLOUR CATCHER® sheets capture the colours that run in the water during the wash, ensuring maximum protection against colour runs and allowing you to wash all colours and whites together. 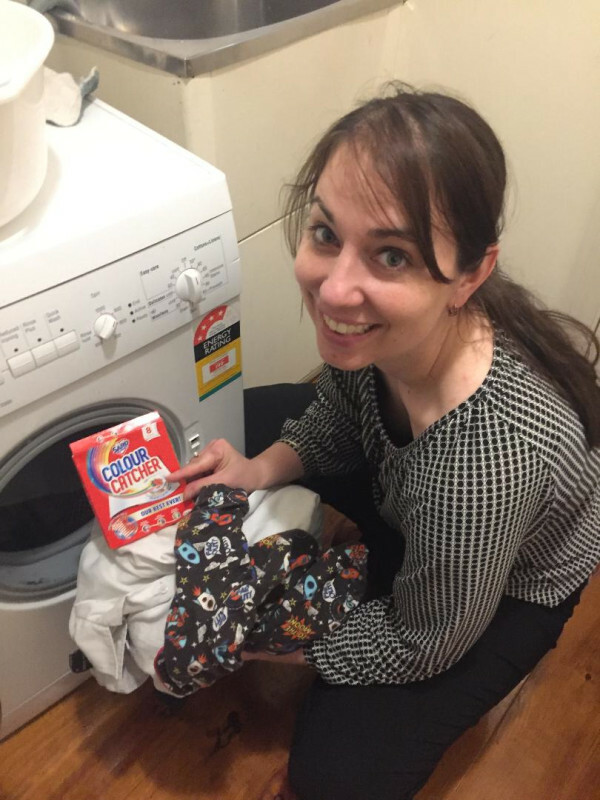 Trap Dirt – COLOUR CATCHER® sheets trap loose dirt particles that may settle in your washing machine preventing your clothes from looking dull over time. How does Colour Catcher® work? With a typical laundry wash, colour dye releases in every wash and might bleed into your laundry. 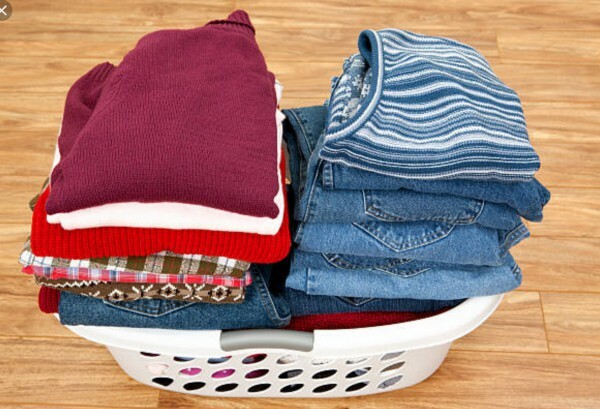 Loose dirt particles may also settle and leave your clothes looking dull over time. Thanks to its patented technology the Colour Catcher®, sheet acts like a magnet and traps loose dye and dirt during the wash, assuring brilliant wash results. Check out what our members thought! Where to buy Colour Catcher®. Colour Catcher® can be purchased at all major retailers in Australia. Find out more here. 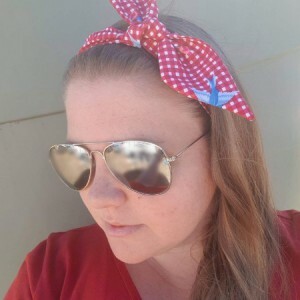 These absolutely work – red blacks navy’s and whites tested after an accident, no colours leaked onto my Saves time money and worry, they are in every weeks grocery shop! I have been using colour catcher past couple of weeks and it was recommended by one of the staff members of a well known Children Clothing when I went to them to returned a Tshirt that I had bought for my son that left red color on others while washing. 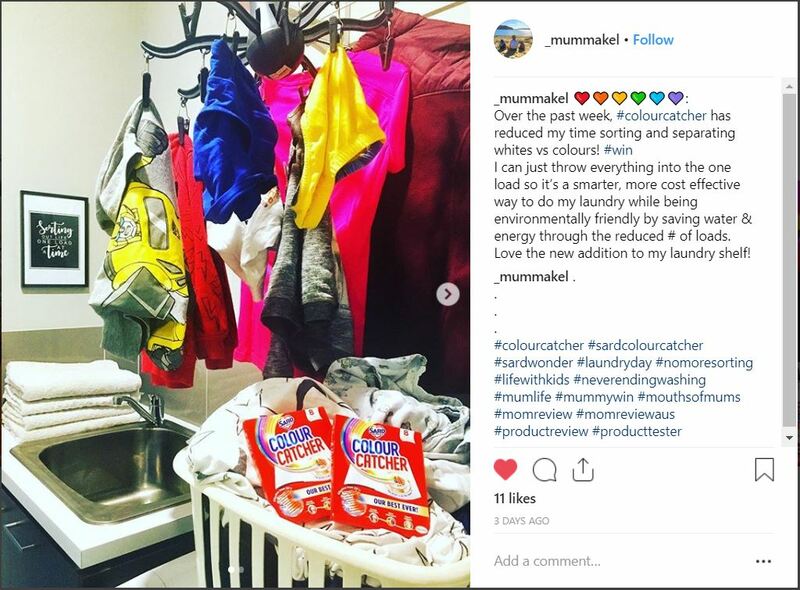 Colour catcher has not only saved me time but also my kids have started doing their laundry as they find it easy to just pop all the clothes in washing machine without separating the whites. I love colour catcher. Easy to use. just place the colour catcher sheets in the wash put the washing in the washing machine with the powered. No need to separate the washing. Saves me time and can fill the washing machine. Awesome!! Saved my whites and my time! I went into this test nervous that I may wreck a few clothes and white bedding, but was very pleasantly surprised when my whites came out bright, my pinks retained their colours and the Colour-catcher came out pink..obviously catching any of the colours that would otherwise have ruined my whites. Thankyou Sard, your Colour-catchers have saved my whites, my time, my sanity, and my marriage! No more pink socks for hubby! I hate separating washes because they are dirty clothes and also take time to separate that’s why sometimes I put them all together and later regret seeing my white tees and bed sheets being pink. Now I am so relieved that I found colour catcher which works like magic. I was really surprised on its results, my clothes came out as exactly as I put in. I don’t need to separate , easy to use and save my time. Love it. Would definitely buy again and would recommend everyone. I’ll be honest I have definitely ruined more than a few garments mixing colours in washes. I tried the colour catcher sheet in a couple of washes and seen results. 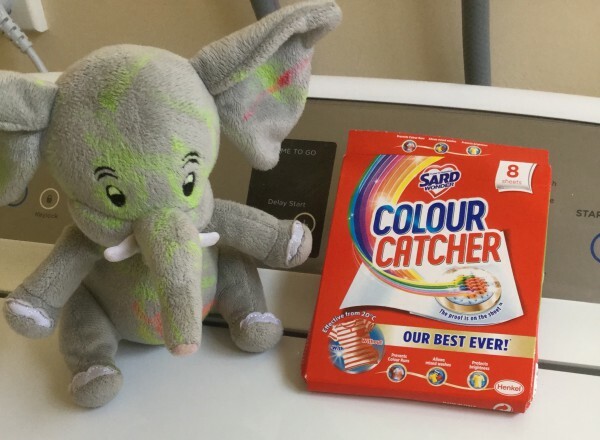 I washed my little girls elephant after she decided to colour it with highlighter. The colour catcher sheet absorbed it. As a small handmade business owner, I do a lot of washing of brand new fabric. I dont have the time to be doing several loads of small washes when I receive new stock due to the fear and past experience of colours running. The Colour Catcher is a total game changer! I can now wash bright colours with darks which now saves my business time and money which equals more profits. And the bonus is that it is so easy to use. Pop it in the washining machine drum and it does the work for me. Colour Catcher will now be a stable in my laundry. Thank you Sard! This product is AWESOME! It does everything it says on the box. I was quite skeptical on this product before trying it but it was recommended to me by a close mum friend of mine and I’m so glad I went ahead and purchased it. It even brings up the colours in your clothing so much brighter. It is a product that needs to be used over time but you definitely see results. Extremely useful product that I will continue to buy! Also a product to use if you want your whites even whiter! Follow the directions exactly though to achieve the best results. You won’t be disappointed! I can’t get enough of the Colour Catcher. 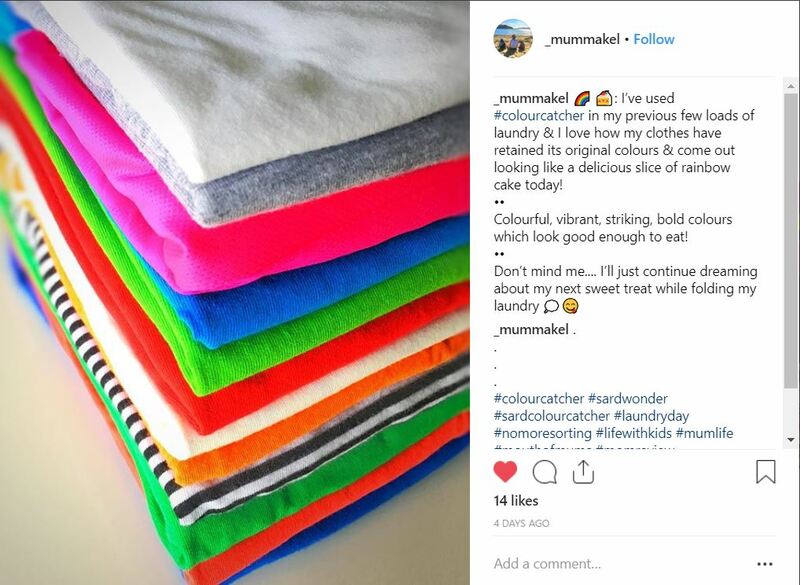 It really works and you can see the results at the end of the wash – the Colour Catcher will literally catch the colours and your washing will look amazing and vibrant! It means I don’t have to save my dirty laundry until I have enough reds to do a separate load. I used this and it was great, did exactly as they said it would. The colours in my sons shirts did not run. I put a red shirt in with a white shirt and the white shirt stayed white. The other shirt has white, maroon and black on it and that also did not run. This is a good product and I will be using it and buying it again. I used the colour catcher in my whites and mixed some colours with it and it did a great job. I had no runs in the colours and the whites stayed white and did not turn pick or anything. I will be buying these again to use. Colour Catcher saves me time and is easy to use, i will definitely buy Colour Catcher again, it stopped colour runs in my mixed wash. When I used Colour Catcher it meant doing fewer loads, i would recommend Colour Catcher to others. Awsome product and will a I’ll ways be in my shopping cart. I used colour catcher for a little while and I need to be honest I’m not sure it did much. I already mix my colours and whites and don’t often have running problems so it’s hard to know if the product does very much or if it effective. At least it gives me some peace of mind more than anything else. Absolutely love the idea of the Colour catcher. Not having to sort between my whites and colours. Saves me time and money by being able to do less washing and always having my washing machine full. From the dirtist clothes of my husbands to my kids with the sand, each load now comes out cleaner. I used this product to save some white items that my partner washed with red, that had turned a lovely pink colour!! After using the colour catcher the pink was gone and they were like new!! Crisis averted!! I am not sure why people use colour catchers really. I have never had colours running and I do mixed loads all the time. I also have enough laundry in my house that I can easily do a load of darks and lights without needing this. Have used it. Saw no difference really. Will save my money. 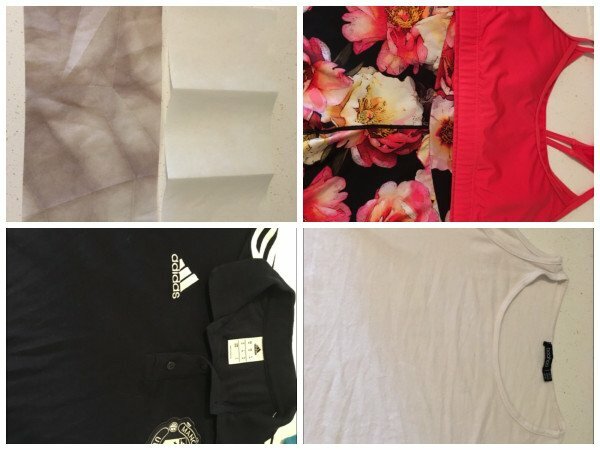 I found colour catcher amazing.. was easy to use, helped for those busy days when I don’t have time to separate and make my clothes come out so bright.